Historic Background: On August 5, 1864, Admiral Farragut led a flotilla of 14 wooden ships, four ironclads, and numerous gunboats into Mobile Bay to seal off the city of Mobile, one of the two remaining Confederate ports. Guarding the bay were Forts Morgan and Gaines, natural and manmade obstructions, torpedo (mine) fields, and a small confederate naval force under the command of Admiral Buchanan, embarked in the ironclad CSS Tennessee. While entering the bay, the Union monitor USS Tecumseh struck a submerged torpedo and sank. Under fire from both the Confederate fleet and Fort Morgan, Farragut had to choose between retreating or risking the minefield. He then issued his famous order, "Damn the torpedoes! Full speed ahead!" Passing the minefield safely, Union ships defeated the Southern flotilla, while Union ground forces captured the forts. Although the city of Mobile remained in Confederate hands, the last blockade-running port on the Gulf Coast east of the Mississippi was closed. Though both ironclad and wooden ships fought at Mobile Bay, this game gives players the opportunity to see how an all ironclad engagement may have been fought with ships of varying designs, and consider the trade offs naval engineers must make when designing a warship. Battle 1 (Playtest): The Union fleet bravely steamed right through the mine field, suffering only minor damage to one vessel. One large ocean going Union ironclad led the the attack, moving far ahead of her sister ships. She engaged the Confederate fleet at short range, directly under the guns of Fort Morgan. This aggressive tactic succeeded in pinning most of the Confederate fleet, allowing the remaining Union ships to maneuver freely. Both sides opted to engage the enemy at close range, and ramming attacks did considerable damage to both sides. One light Confederate ironclad was able to slip past the Union fleet, steaming through shallow water where the heavier ships couldn't follow, and attack the Union ships from behind. Two Union ironclads were assigned to chase her down and, after a lively pursuit and battle, the battered Confederate was forced to surrender. Slowly the Union fleet was able to destroy the Confederates, while suffering fearful damage in return. Fort Morgan, in particular, did a lot of damage. In the end the Confederates were defeated, and the battle was a Union victory. Ironclad: After deciding on an ironclad class, darken the outlines and color in those portions of the ship template that correspond to your design. If your ship has guns on both the right and left sides of the ship, ensure you color in the right number of gun ports. If a turret has only one gun, color in the fore or aft facing gun, otherwise color in the two side spots (on one side only! Remember, the turrets can turn, so don't worry about which side the guns are colored in on.). Other building tips are on the templates. You can add extra items like masts, rigging, and additional flags that are not on the template, but no additional guns, armor or stacks other than those already on the template. Status Sheet: Once your ship is designed, fill in the status sheet. Be sure to darken the appropriate lines on the status sheet template to represent your ship. This will be used to mark off which cannons are damaged. Fill in the characteristics of your ship in the center boxes. Finally, cross off the unused damaged boxes next to Cannons, Armor and Boilers. There should be one block for each inch of armor, cannon and boiler. These will be used to track overall damage during the battle. Displacement and Draft: Builders may add an additional 180 tons to the basic hull of the large Ocean-Going Class ironclads and 120 tons to the smaller River Class ironclads. Every cannon, overall inch of armor, steam boiler/furnace, and ram adds 10 tons. A ship sits in the water (draft) as deep as the total added weight divided by 20, rounded up (adding 150 tons to a ship would result in an 8 ft draft). Armor: Maximum iron plate armor is 12 inches on Ocean Class, 10 inches of iron/wood backed armor on River Class. Every ship must have at least 1 inch of armor. Steam Power (Boilers/Furnaces): Both classes use steam power. Ocean Class ironclads use screw propellers below the water line, River Class use paddlewheels mounted in armored structures near the stern. Every ship must have 1-4 boilers/furnaces. 1-2 boilers need one smoke stack; 3-4 boilers need two stacks. Stacks do not add weight. 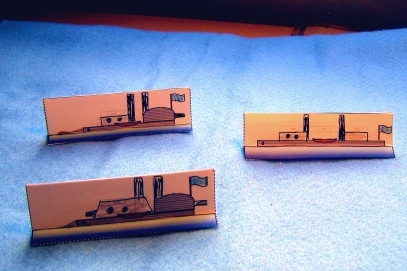 Cannons and Mountings: Maximum number of cannons on an Ocean Class is 14; River Class is 8. Guns can be in revolving turrets or fixed casements. An Ocean Class has room for any combination turrets and casements up to a maximum of three 'structures' (3 end-to-end casements, or 2 turrets and 1 casement, or 3 turrets, etc) . A River Class has room for two structures; however, one structure is required to house and protect the paddlewheel, though has room inside for one optional aft pivot gun. The builder may therefore only add one turret or one casement to the forward part of the ship. A turret can hold 1-2 guns. Turrets can fire in all directions not blocked by another part of the ship (excluding stacks). Broadside casement guns must be pointed within 10 degrees of the target. Fore and aft casement guns can pivot up to 45 degrees either side of centerline. Rams: Rams attach to the bow and increase the chance of causing damage when ramming. Rams add 10 tons of weight to the ship. Both Ocean and River Class may use rams. Spar Torpedoes: Only River Class ironclads may have a spar torpedo. When rammed against another ship, the torpedo explodes. A spar can only be used once. A spar does not add weight, however a spar limits turns to no more than 45 degrees per move, regardless of number of boilers operating. Turns greater than 45 degrees will cause the spar to break off. A ship cannot have both a ram and a spar torpedo. The game is played on a 5' x 7 ½' table covered with blue cloth. Green felt shapes can be cut out to represent Mobile Point, Dauphin, Pelican and Sand Islands. Place Forts Morgan and Gaines on Mobile Point and Dauphin Is. respectively. Blue yarn is taped down to mark the boundary between deep water (10+ feet) and shallow 5 foot water. Green yarn is used to mark the boundary between shallow 5 foot water and 3 foot shoal water. If any part of a ship base touches the yarn, it is considered to be in the shallower water for grounding purposes. Place the Confederate navy anywhere north of Forts Morgan and Gaines. Place the Northern navy anywhere south of the Sand Is. Obstacles: Pilings - Southern players may place 8 pennies any where in water 5 feet deep or less to represent pilings. To pass a piling, no part of the ship's base can touch the penny. 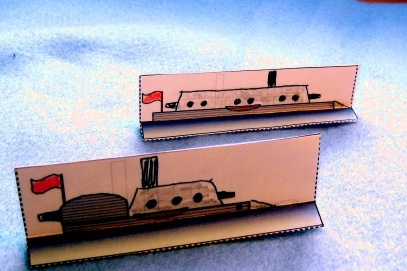 Torpedoes (or mines) - Cut out eight 1 inch squares from blue construction paper. Place an 'X' on one side of two squares (tip: use pencil, markers tend to bleed through). Turn the X's face down and shuffle with the unmarked squares. Southern players then lay the squares face down anywhere north of the Sand Is. If a ship's base touches a square, turn over the square. If there is an X, a torpedo has exploded! Roll for damage per spar torpedo rules. Move Sequence: (1) Union navy moves/fires, (2) Forts fire, (3) Confederate navy move/fires. Movement: An ironclad may move one base length and turn 45 degrees for each boiler operating. Moves ahead and turns can be conducted in any order. A ship with three boilers operating can therefore move three lengths and make up to three turns totaling 135 degrees, though any one turn cannot exceed 45 degrees. A ship may also move backward, but cannot move forward and backward in the same turn. Attack: First check for hits - Roll 1d6 for each operable gun able to bear. (Note: If firing more than one gun, for each pair of 'snake eyes' rolled, one breach explodes!) Short range (0-4 inches) hits on 4-6; medium range (5-8 inches) on 5-6, and long range (9-12 inches) on 6. Second, check for armor penetration - Attacker re-rolls dice that indicated hits. Defender rolls 1d6 for each 2" of armor remaining, rounding up. Pair highest attacker/defender rolls, larger number wins. Check next highest pair, etc. Ties go to defender. If the attacker has more dice then any unmatched dice automatically penetrate the defender's armor. Defender determines distribution of any damage by marking off a gun, armor inch, or boiler from his status sheet. If last gun is destroyed, ship can no longer fire. If last boiler is lost, ship can no longer move. If last inch of armor is lost, ship is destroyed! Ramming/Collision: If ship bases overlap, each ship rolls dice equal to the sum of armor remaining + boilers operating, divided by 2. If the ship ramming has a ram bow installed, roll one additional dice. Pair highest dice. Higher dice inflicts damage on lower. If defender rolls a 6, attacker also loses ram. In ties, both are ships damaged. Players determine damage distribution per Attack Rules; however at least one damage point must be applied against a gun on the side rammed. If rammed from behind, at least one damage point must be applied to a boiler. Grounding. If sailing into water less than ship's draft, then ship will run aground. On grounding, roll 1d6. 1-2 causes 1 damage point to boilers, 3-6 causes 1 damage point to armor. If engines are still operable, roll 1d6 each turn to break free. Successful on roll of 5-6. Spar Torpedoes. If a River Class ship hits another ship with its spar torpedo, attacker rolls 3d6 and defender rolls 1d6 for each inch of armor remaining. Tie goes to defender. Each winning attacker dice causes 2 points of damage. Damage is distributed the same as ramming. Forts. Players who lose ships can man the forts and roll for submerged torpedo hits. Each fort is divided into five batteries, A to E. Each battery fires and defends in the same manner as ships. Each battery consists of 2 casement guns which can pivot up to 45 degrees either side of centerline, and one cannon mounted on top of the bastion capable of firing 360 degrees. When firing on ships, battery rolls 1d6 for each gun able to bear. When defending, the fort walls are treated the same as 10 inches of armor. When attacked, the battery struck is determined by rolling 1d6. 1 = A, 2 = B, etc. 6 = defender choice. Damage within a battery (gun vs. wall) is determined by defender and marked on the fort status sheet.